Imagine this is the real deal sitting on a spinning platform at (hopefully) the 2019 Detroit Auto Show. Do you like what you see? 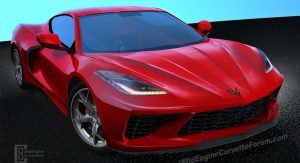 While this new 3D model made by Corvette Forum user Chazcron looks impressive it just doesn’t seem to have that special something buyers want from a mid-engine sports car. 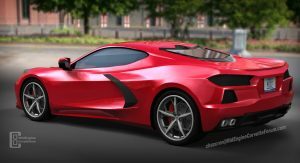 Yes, the proportions are good and the details are generally nice but overall this interpretation of the Corvette C8 looks like a generic mid-engine sports car. This is in no way a criticism of the artist that created this 3D model — we’re grateful for it. It’s just a reminder that all the renderings we’ve seen so far are mostly shots in the dark. All are based on spy photos of actual 2020 Corvette C8 test prototypes fully-wrapped in camouflage foil that can very easily trick the eye. Looking at the Chazcron’s 3D model and renderings, we believe the surfaces will be easier to distinguish on the finished item. 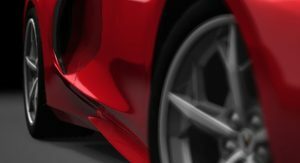 Also, there seems to be too much sheet metal on the rendered car in some places, particularly above the rear wheels. 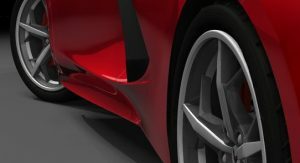 From the spy photos and videos we’ve seen, the Corvette C8 will look more slender in that area. Obviously, the design is a matter of personal preference and some people may not see things the way we do. 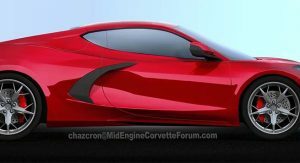 One thing we can all agree on it’s that the mid-engine Chevrolet Corvette C8 can’t come soon enough. Here’s hoping GM will unveil it at the 2019 Detroit Auto Show in January. 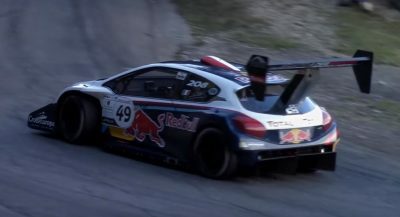 We can’t imagine having to watch this video in a loop until the New York Auto Show in April — but we will if we have to. american cars trying to become like the italians. epic fail! It worked for the mustang. Give it time, it will grow on you. i’ll give mustang the credit since is kinda my only favorite american muscle car but the rest is meh…. You and everyone else will change their minds once they see it on the streets. This is a great time for american performance cars! Exactly what I think every time I see it. I stand corrected….Exactly…..those air intakes and the qtrs looks like “add on’s” after thoughts. Not a smooth transitional look at all. It looks like a crappy kit-car made in someone’s garage on weekends. Job well done GM! Looks like the 30 minutes spent on this was productive. Looking forward to seeing Malibu window switchgear and Impala instruments on the dash, and you somehow saying it will cost $180,000. It looks like some other sports car, not a Corvette. The rear looks OK, but I still prefer the overall look of my ’18 Grand Sport. Answer to the title: NOT. The side view is horrible ! The quarters look really disproportionate to the rest of the vehicle. Hopefully this “translation” is not representative of the actual vehicle. It looks like a previous generation Ferrari 348. and that’s not a good thing. the rear end is fugly. Looks like a generic sports car from Grand Theft Auto. The Coquette is just a C7 ripoff. Every time I see this thing I cant help but wonder: who asked for this? Looks like they finally succeeded in getting that 60’s design through!!! Looks like a 360 Modena with big side vents. It doesn’t look American or aggressive at all. This is sad… I’m far from a corvette buyer, I’m not even a fan, but I always liked the personality and distinctive design of the ‘Vette. The design started to be strange in current generation, but it is still acceptable. 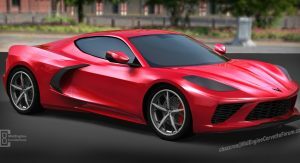 But this outdated, strangely proportioned design of a mid-engined Modena… I mean Corvette, that does not look like a Corvette at all, is not acceptable at all… Hopefully, Chevrolet just purposefully camouflaged the design by making it look like an older kit-car and the real appearance will be revealed much later. Jesus it’s just a cgi of a car.. I am sure it’ll look just fine when it’s revealed.. it’s not that ugly.. lacking originality yes but ugly i doubt it’ll be.. having said that .. time to resurrect the viper.. now that was an original American sports car! I see a Ferrari 360 Modena from 20 years ago. I also think the design, square exhaust tips and all will age quickly. It didn’t need to look like the last Corvette. It just makes me dizzy. I really don’t like it. That’s still a ‘no’ from me. Looks great to me, but I can’t help but think GM finally brought to production a proper Fiero. The real thing looks way better than the graphic rendering. Many details missed and inaccurate. It is roughly accurate so haters please calm down. This is a big model change. These sort of renders always come across as generic, they hide the finer design details and the effects of paint and light. That said this is a good render. What we probably do see is the basic design which I find classic and clean. 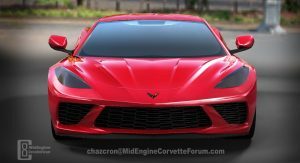 The real question is if this is what a Corvette buyer wants or if this will attract enough new buyers. I still say call this the Corvette Zora and spin Corvette off to its own brand. Then bring out a C9 Corvette Stingray in a few years respecting the original front engine layout which also lends itself better to a coverable. huge anticipation for this car, really hope it will succeed against euro sports cars. 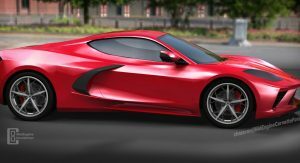 “One thing we can all agree upon, is for the C8 to hit showrooms doubling the price of a new Corvette placing it out of reach of most Corvette fans”. Whatever GM is trying to accomplish by advsncing Amerca’s sports car into real supercar territory, they are really just destroying it. Whether its even going to be a better car is debateable. Yeah yeah yeah “but mid engine cars handle best!” Not for you and I they don’t, maybe for an expert on the track with brake markers and if you think otherwise you have never owned an MR platform and driven it hard on public streets. I have and even repeating the meme “don’t lift mid apex” over and over in my head, narrowly missed killing myself a few times. (and that was in a humble 914… those who would mock my skills can educate themselves about snap oversteer with the clips on youtube of lotus elise owners spinning off into the weeds on tracks… and totalling their prized toys on the street.) The FR corvette like the C4 I owned for 27 years is much more fun in the real world with its predictable handling giving you plenty of warning before you spin when you are too hot into a corner. If the intent was for all of us to chant “USA-1!” for a car we only dream of driving much less owning so GM isnt embarrassed when journalists put it up against Fords GT well I guess they have something. I doubt many people reading here are in the income bracket to own one so dont know what they are anticipating. The ’80s Corvette Indy on the calendar I used to have on my wall has as much use to me as this thing- or more. It was much prettier. Well it’s no GT40 and looks like a watered down version of a Ferrari…488 possibly. 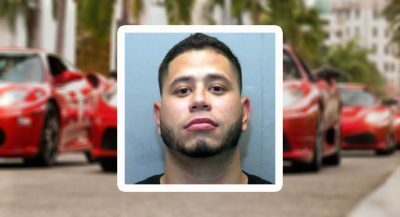 Hopefully Vette is going in the right direction but will seemingly be playing catch up unfortunately. We need a tone setter…a “Super Vette”…a Blue Devil or Manta Ray if you will. It not only needes to be a marginal performance difference with Bugatti like numbers but a visual complete difference from a regular Vette….maybe a whole new car model all together for GM/Cheverolet’s flagship performance car…ie Ford’s GT40 to GT500. I like it overall even though the design doesn’t necessarily in my opinion flow and looks some what forced. It looks like someone took cues from previous models, looked at a couple Ferrari designs and forced it all together. Design needs to look toward it’s passion bloodline for its future not staying with cues of its past. We will see…if sales numbers stay the same you just maintained the Vette loyalist…if numbers double at least like all great break through innovative designs you know you hit your mark. Good luck GM…America and the world for that matter is still waiting to see if you can set the tone. I personally liked when America had the cockiness to be bold with attitude like in the late 50’s & 60’s. We didn’t look or even blink to the world for cues they looked at us. Agree with others who say the styling borrows heavily from the Ferrari 360/F430, but that’s not necessarily a bad thing. That design is nearly 20 years old and still holds up. 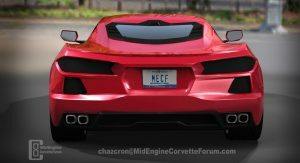 I am still looking for a link from GM that the mid engine car is going to even be a Vette. Might be a Cadillac. 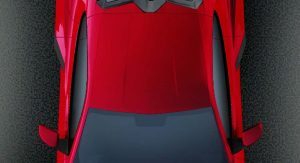 I wonder if this is like when everyone had a sneak peek at the C7 and they had all of the details but missed a lot of the actual shape and proportion of the car. I remember looking at Car and Driver and thinking ‘yecch’ but when I saw the finished product, it looked so much better. Why copy from Ferrari and, in a way, Lambo? The Vette is so original and they ruin it. Gracious goodness….why why why? Tiny glass area, like the Camaro. Isn’t there somebody under 5’10” designing this stuff? And the front overhang is too short. The vehicle looks disproportionate from the side view.